The overall printer market saw revenue surge 14 percent in the second quarter to $13.3 billion, according to IDC. Hewlett-Packard continued to gain share. 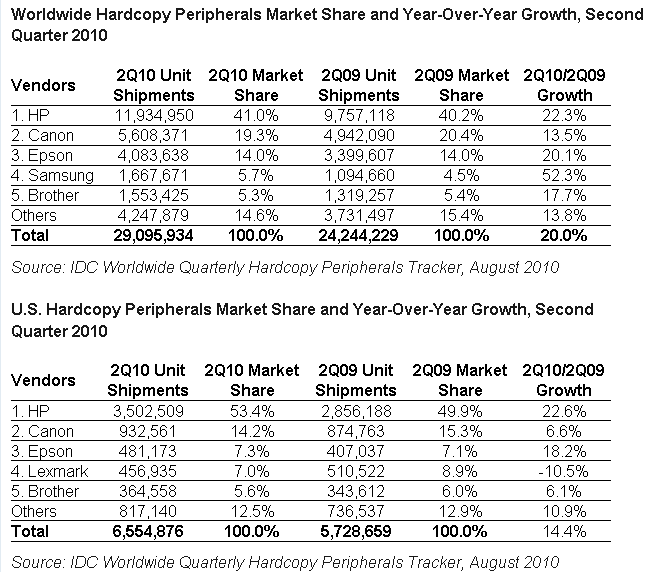 IDC expects that the printer market will bounce back through 2010, but competition will heat up. Inkjet printers have 66 percent share of the printer market. Meanwhile, inkjet printers posted 14 percent unit growth in the second quarter with 19 million units. That’s the most growth since 2003. Laser printers posted the strongest growth with units up 25 percent to 9 million in the second quarter. Monochrome laser printers accounted for 83 percent of the market. Metawatch, has and continues to recommend only Canon and Epson series of printers as they offer headless inkjet cartridges thereby enabling you to purchase lower cost inkjet supplies. Their increased robustness of the imbedded heads in their printers also ensure a longer lasting reliability. Brother, Canon, Dell, Epson, HP Japan and Lexmark announced today that, as part of their Ink Cartridge Homecoming Project, a collaborative effort to collect used consumer ink cartridges, the six companies would begin making donations to the United Nations Environment Programme (UNEP, HQ: Nairobi, Kenya) on April 1, 2010. The Ink Cartridge Homecoming Project, launched in April 2008, is a cooperative effort by six print device manufacturers and the Japan Post Group to collect used ink cartridges. The project was started with the belief that companies marketing inkjet printers have a social responsibility to recycle used ink cartridges and should work towards the creation of a recycling-based society through conservation efforts. Representing a new facet of the Ink Cartridge Homecoming Project, the six companies will provide UNEP with donations to support its various activities targeting such global environmental issues as global warming, climate change, threats to biodiversity, and the efficient use of resources. By providing indirect assistance to UNEP activities, including forest protection and biodiversity conservation, the project will attain a higher level of social significance and take an increasingly active approach in global environmental protection. Every six months, the Ink Cartridge Homecoming Project will make a donation to UNEP of three yen for every ink cartridge returned to any of the ink cartridge collection boxes installed at 3,639* major post offices and select local government offices across Japan. The first donation period will run from October 2009 to March 2010, with subsequent donations to be made every six months thereafter. The six companies would like to ask its customers to help promote ink cartridge collection and recycling in an effort to contribute to society through donations to support UNEP’s environmental conservation activities. The Ink Cartridge Homecoming Project’s UNEP donation activities will be featured at the Ink Cartridge Homecoming Project booth during the Interactive Fair for Biodiversity, which will be held concurrently with the 10th Conference of the Parties to the Convention on Biological Diversity (COP10) in Nagoya City, Aichi Prefecture, from October 11 to 29, 2010. This marks the first time for the private sector in Japan to contribute to environmental conservation activities in the Asia-Pacific region through donations to UNEP, an indication of UNEP’s strong support for the project’s cause and content. The inkjet market can be further divided into the cartridge technologies utilized. Fixed Head with Removable Cartridge. The print head is a permanent fixture of the printer and is not removable. Cartridges are simply plastic repositories with (electronic registers) for remaining ink measurement. Note: HP is transitioning to a fixed head philosophy in many of its newer printer model lines. Third party generic Cartridges are only available for printers using a fixed print head. All third party cartridges are simply plastic repositories with (electronic registers) for remaining ink measurement. As this is the area where most cost savings can be identified, we recommend that your selection of printer manufacturer be limited to Canon or Epson. There is a significant third party market that exists for the purposes of Re-cycling integrated Print Head/Cartridge assemblies. They clean and electronically test each re-manufactured cartridge for re-sale. Unfortunately these cartridges suffer from a higher overall reject/failure rate versus that of a new cartridge, and offer little savings versus that of a new original cartridge. These cartridges can be found for the HP, Lexmark, and Dell printers. As we are all aware that the printer manufacturers all follow a Business Strategy first adoptedby Gillette. Offer a product (Razor Handles) at little or no cost and charging a higher rate of return for replacement parts (Razor Blades). The printer manufactures do the same, offer their printers at cost or below, and then maximize profits via the sale of inkjet replacement cartridges. You can beat the manufactures at their own game by ensuring that you select a printer/model that offers 3rd party replacement cartridges where you can purchase replacement cartridges at approximately 60%-75% less than New OEM cartridges. I.E. A full set of replacement cartridges for Canon or Epson Printers are in the order of $22-$32 cdn. A replacement set of OEM cartridges for an HP printer are in the Order of $80.00. What if you already have an HP or Lexmark Printer? Believe it or not we recommend that you purchase a NEW replacement printer (Canon, or Epson) that offer 3rd party cartridge capability. Yes, that right, you can purchase a New replacement printer, in most cases for less than you can purchase replacement cartridges for an HP, Lexmark, or Dell printer. Not only do you get a new printer, but the new printer comes with a set of inkjet cartridges (Although normally partially filled). Typically you can purchase a new Photo or Multifunction printer with Cartridges from Canon or Epson for less than the cost of a set of cartridges from HP, Lexmark or Dell. Curently selling for $69.99 cdn after rebates. If you have the capability to purchase a new Canon or Epson printer On Sale from a reputable supplier that is supported by 3rd party Inkjet cartridge manufacturers, you will reap the benefits of lower costs cartridges by anywhere from 60-75% savings per purchase. In effect, you will have saved the cost of the new printer purchase after the first set of cartridges purchased. What are the third party cartridges and models supported for Canon and Epson Printers? Would you like to find more information out about printer designs and function? Note: All numeric representations of savings were accurate at the time of publication. As prices are subject to change without notice we can not guarantee these statements will hold true forward in time. All coments in this blog are personal opinions only and should not in any way be representated as fact(s) or as a statement by Metawatch with respect to product and or quality of independant product suppliers.